Do you find the task of folding clothes so loathsome that you avoid it entirely and simply store your clean clothes in a disheveled pile in the laundry basket on the floor? Or are you so busy tending to the kids and your family that you struggle to find time to fold everyone’s clothes as neatly as you would like? 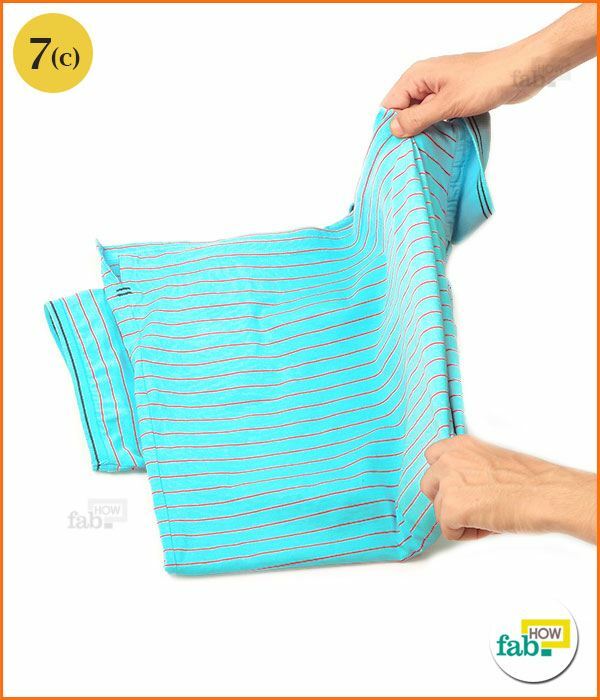 This great trick of folding t-shirt in 2 seconds will surely make the chore a bit easier and, without a doubt, faster. You can fold other short-sleeved tops or polo shirts using this method. Initially, it may take 5 or 6 seconds as you learn the steps, but after practicing a few times, you will easily narrow it down to 2 or 3 seconds tops! Lay out your short-sleeved shirt on a flat surface like a table or bed. The harder the surface beneath the shirt, the quicker the process will be. The front of the shirt must be facing upward or toward you. Flatten out any small folds or wrinkles in the fabric. 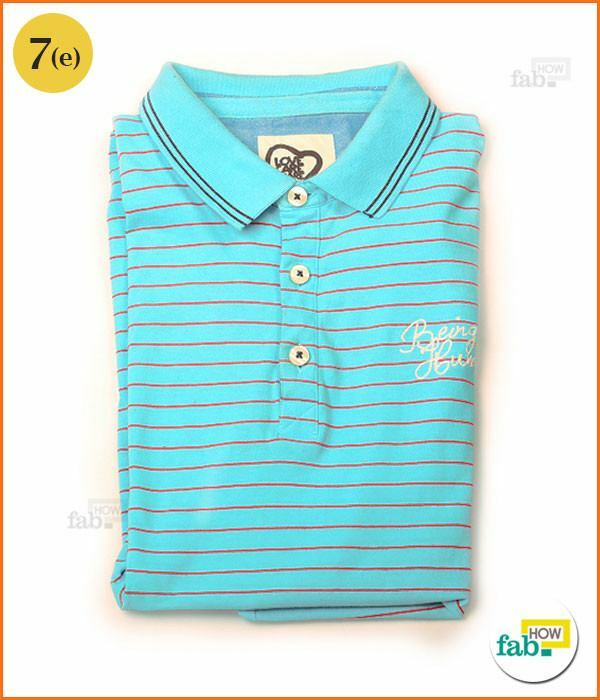 Now, sit on the right side of the shirt so that your right hand is near the neck and your left hand is near the base. 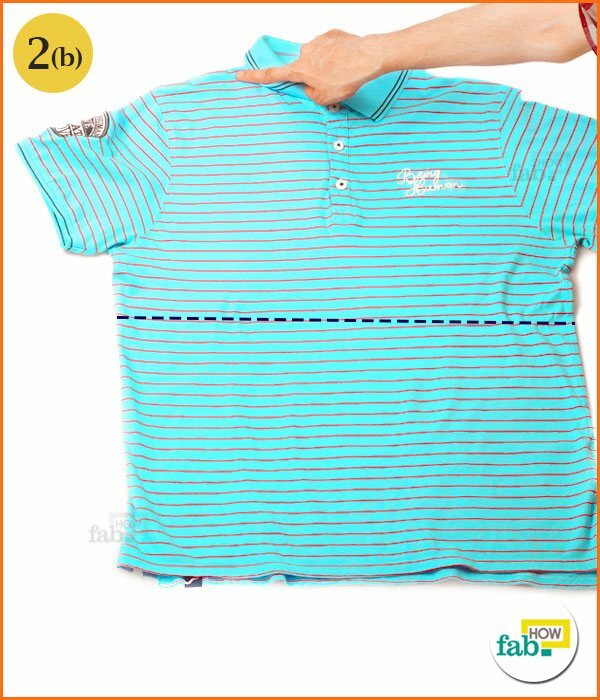 Imagine a line running across the middle of the shirt dividing its length equally in half. 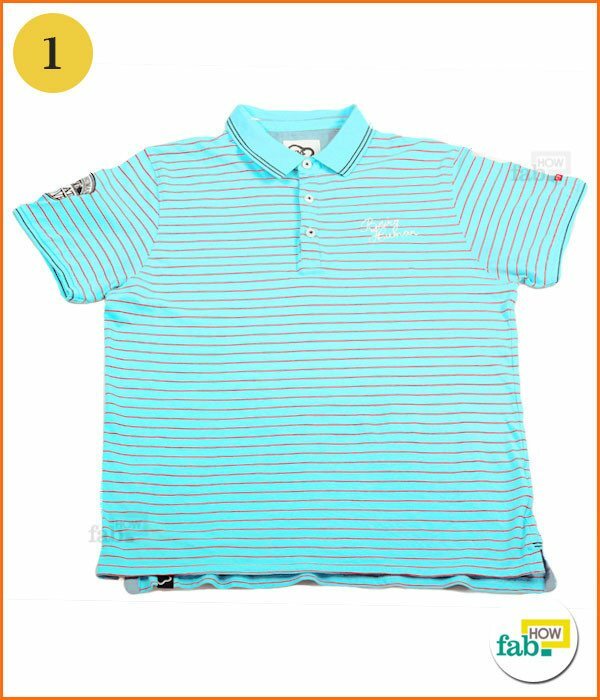 Now imagine another line, starting 2 inches from the collar on the shoulder farthest away from you, running from the top down to the base of the shirt. Where the imaginary vertical and horizontal lines intersect, consider that point A. 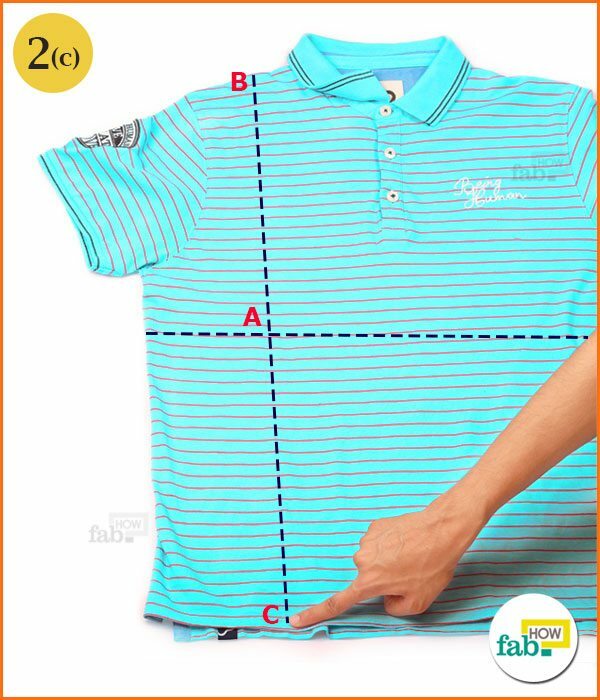 The starting point of the imaginary vertical line on the far shoulder is point B, and where that line ends at the base of the shirt is point C.
Using the fingers and thumb of your left hand, pinch and hold the shirt at point A, where the imaginary lines intersect. 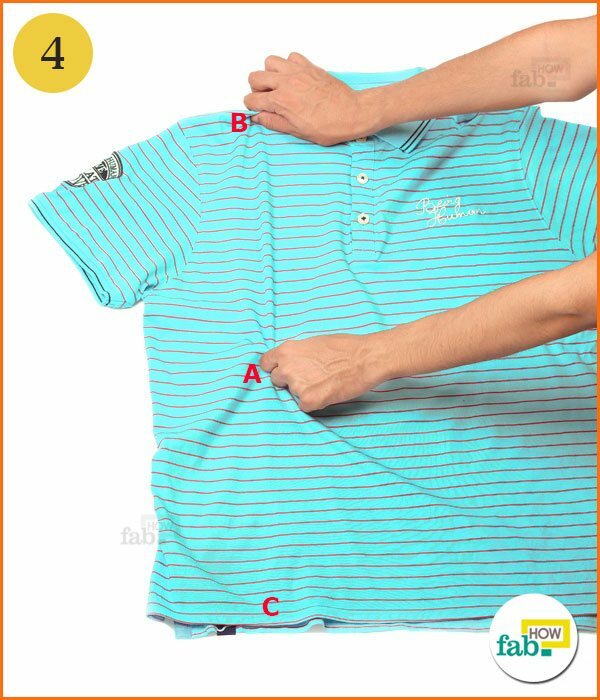 Do not worry whether point A is in the exact middle of the shirt, the process will work itself out. Now, with your right hand, pinch and hold the shirt at point B, the starting point of the imaginary line running down the length of the shirt. 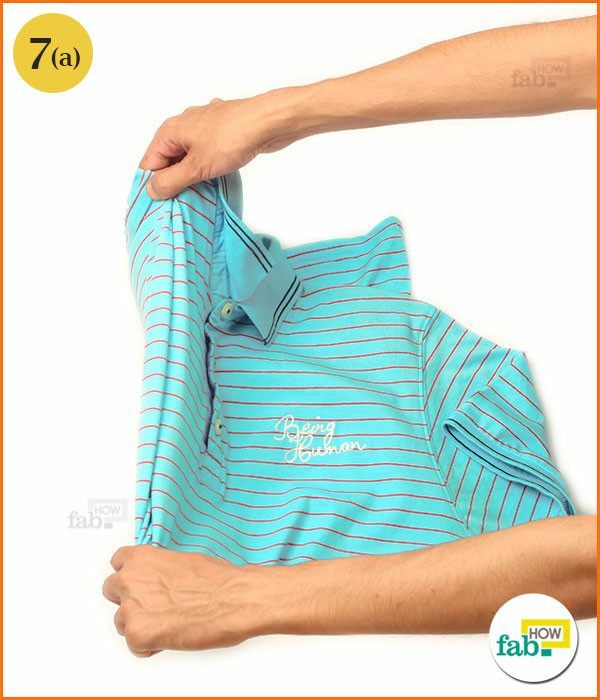 Keep the shirt stretched between both points to ensure a neat fold. 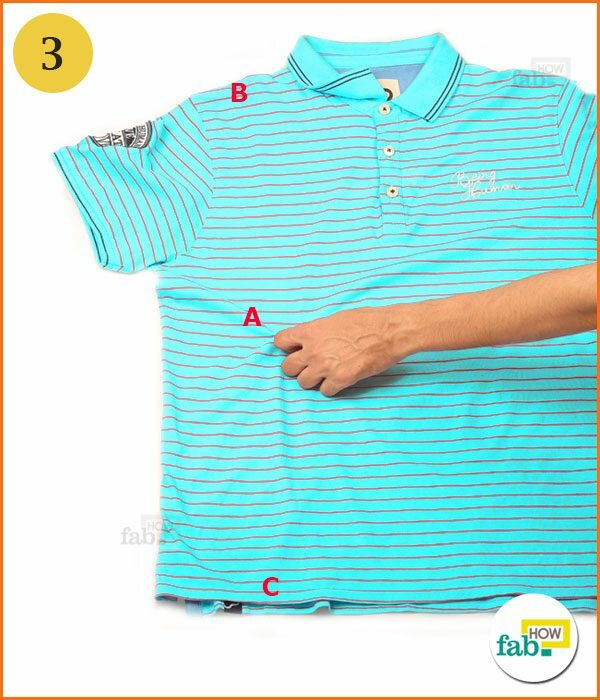 Lift up the shoulder of the shirt at point B and cross it over your left arm, bringing it to point C.
Keep holding the shirt at point B as you also pinch and hold the shirt at point C with the same hand. At this point, your right arm will be crossed over the top of your left arm. 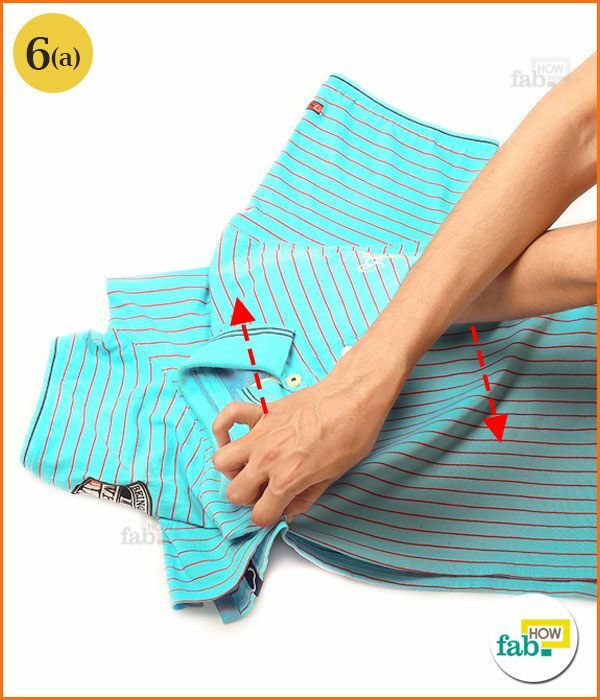 While still pinching and holding all three points of the shirt, bring your hands back to their original position by uncrossing your arms and lifting up the shirt. This is the trickiest portion of this process, so you need to be careful with your hands. Uncross your arms by slowly pulling your left arm out from under your right arm. 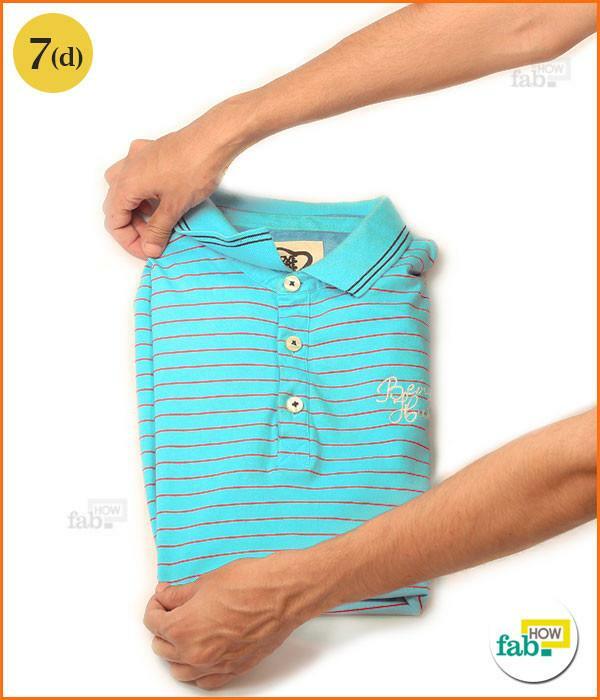 Stretch your arms to ensure the shirt is straightened out in your hands. The shirt will appear in your hands in a near finished form, with a sleeve hanging below. 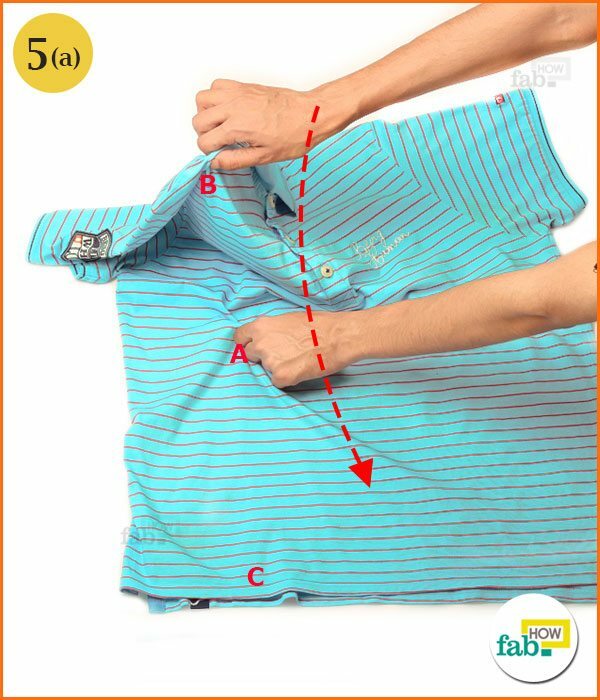 Lift the shirt high in the air and carefully place the hanging sleeve on the flat surface. Now fold the stretched shirt over that free sleeve to hide it. 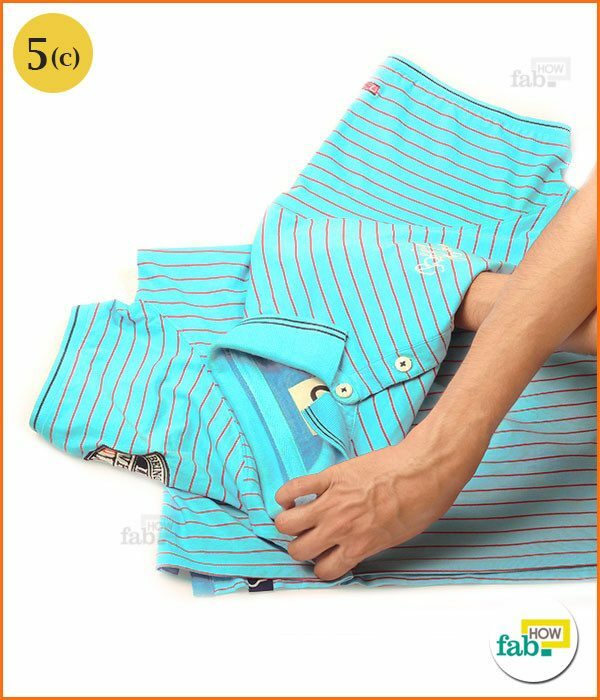 As a result, your will have a perfectly folded short-sleeved shirt. 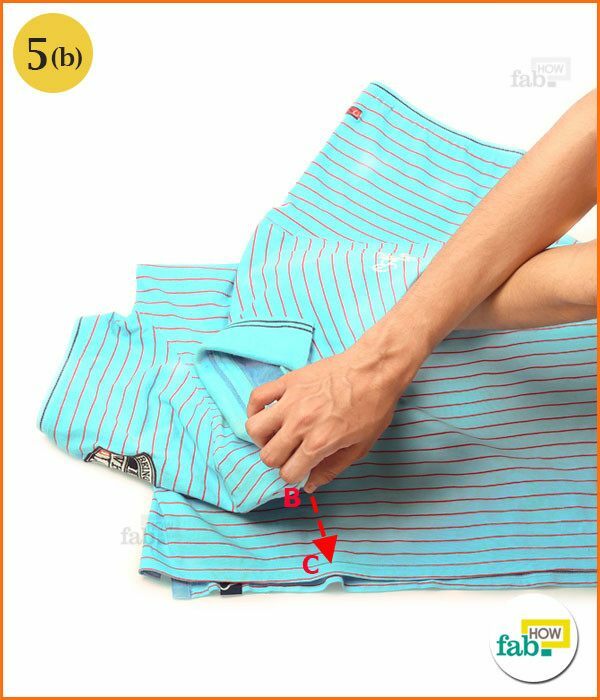 If your loose sleeve is not completely covered by the final fold, you can simply tuck it under the shirt with your hand. 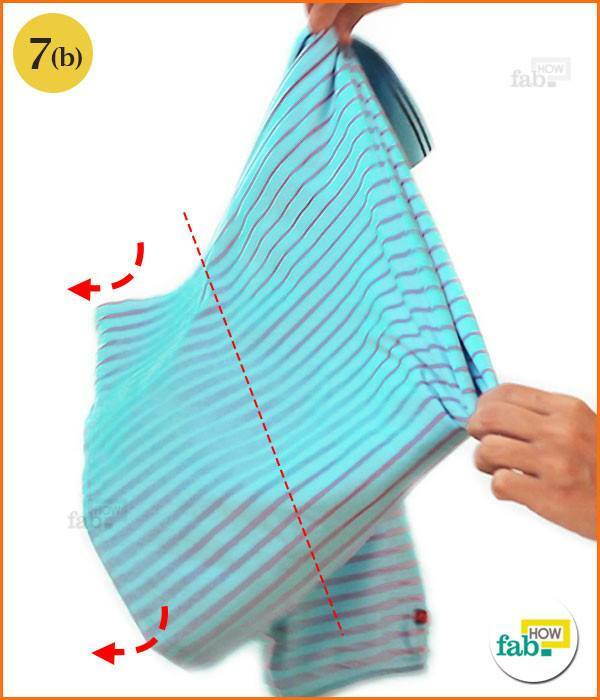 After a few successive trials, you will be able to neatly fold a T-shirt in 2 seconds. This method will work even if you are left-handed, as it uses both hands in fairly equal amounts. 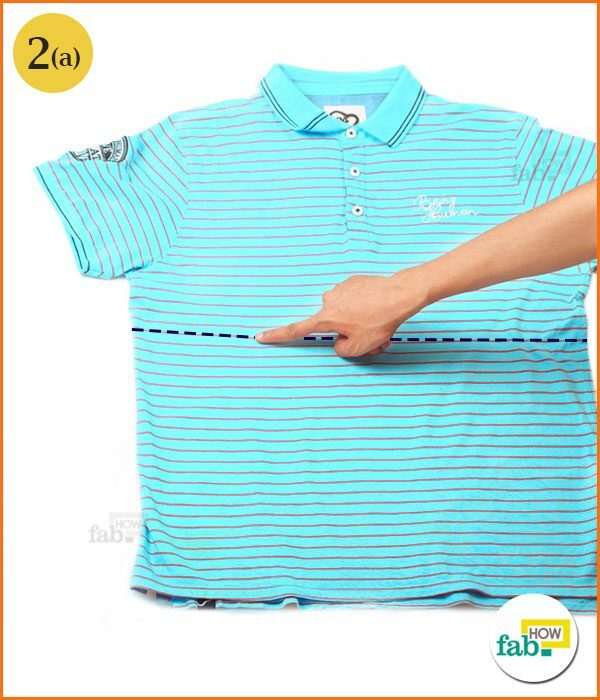 It is not necessary to be precisely accurate while imagining the line that divides the shirt in half. As you practice the procedure, you’ll find it is quite easy to imagine the lines in the correct locations. If doing this on a bed, be careful not to grab the bed sheet or comforter along with the shirt. Do not try this on your balcony or porch, as blowing wind will make the final fold difficult to achieve. The above principle applies indoors, too. Switch off any high-speed fans before folding your shirts.